We’re all in favour of teaching new skills and this week we decided homemade pesto is on the menu. Don’t be alarmed at the amount of olive oil we’re asking you to use … the Mediterranean diet is famed for its health benefits, which can be attributed to the extensive use of olive oil. It’s crazy good for you due to its sky high antioxidant levels (found in its phenolic compounds) and omega-9 content. Omega-9 is one of the “good fats” everyone speaks of, with a plethora of health benefits. Olive oil is 85% good fat so tuck in!!! First you can get all your veg prep done! Cut the shallot in half through the root, peel and then finely chop into ½cm pieces. Peel and grate the garlic (or use a garlic press if you have one). Cut the courgette in half lengthways, cut each half into four strips lengthways, then chop the strips into 1cm cubes. Chop the tomatoe into 1cm cubes. Finely chop the basil and half the rocket (the leaves and stems of both!). Tip: Don’t worry, there may be a lot of prep, but it’s all plain sailing from here! Now for the pesto! Put a frying pan on medium heat (no oil!) and add the pine nuts. Dry fry them for 1 minute, or until they start to turn golden. Tip: Watch them like a hawk or they will burn! 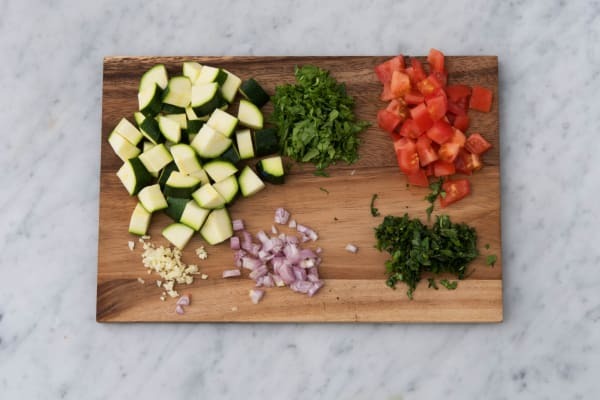 Once golden, tip your pine nuts onto your chopping board and chop them as finely as you can (don’t wash the pan, you’ll use it later to dry fry the courgettes!). Put your finely chopped basil, rocket and pine nuts in a bowl. 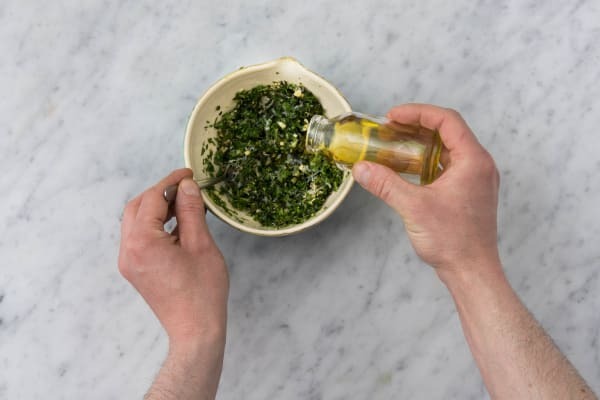 Sprinkle in the hard Italian cheese, a pinch of salt and a good grind of black pepper and pour in your best quality olive oil (the amount is specified in the table above). Add a quarter of your grated garlic and mix everything together thoroughly. Tip: If you do happen to have a food processor, you can use it here, but we prefer the satisfaction of doing it by hand! Squeeze the lemon juice into another larger bowl and pour in a good drizzle of olive oil. Add your tomatoes and a quarter of your chopped shallot. Mix everything together and leave to the side. Put your remaining chopped shallot in a pan with a drizzle of oil on medium heat and cook for 3-4 mins, before adding your remaining garlic and cooking for 1 minute more. Add the orzo and stir it around until it is nicely coated in your garlicky oil, then pour in the water (the amount is stated in the ingredient table above) and add the vegetable stock pot. Bring to a simmer, stirring to dissolve your stock pot, then turn the heat down slightly and simmer gently for 10 mins or until your pasta is ‘al dente’ and the liquid has been absorbed. Tip: ‘Al dente’ simply means the pasta is cooked through but has a tiny bit of firmness left in the middle. Stir from time to time to ensure it doesn’t stick to the bottom of the pan! 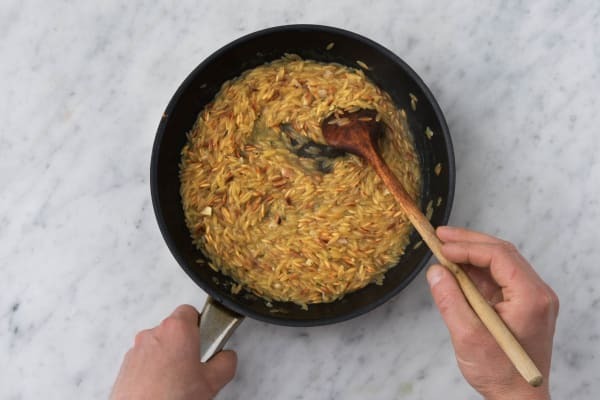 Tip: If all the liquid has been absorbed and the orzo is not quite cooked, just add a couple of tbsp of water and keep cooking. Whilst your orzo is cooking, put the pan you used for your pine nuts back on medium heat without any oil. 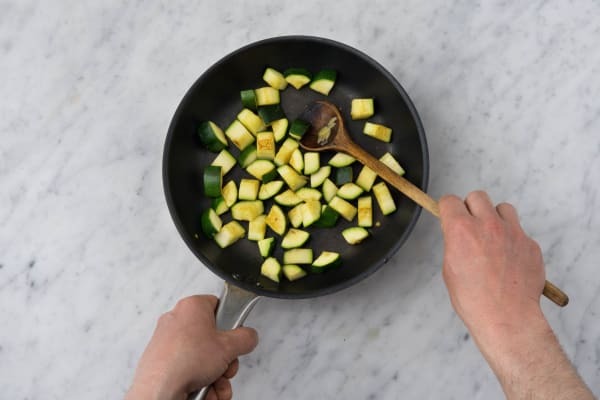 Once the pan is hot, add your courgette cubes and cook them for 7-8 mins, turning occasionally until they are charred. Remove the pan from the heat. Tip: If they are not very charred, just leave them cooking for a bit longer. 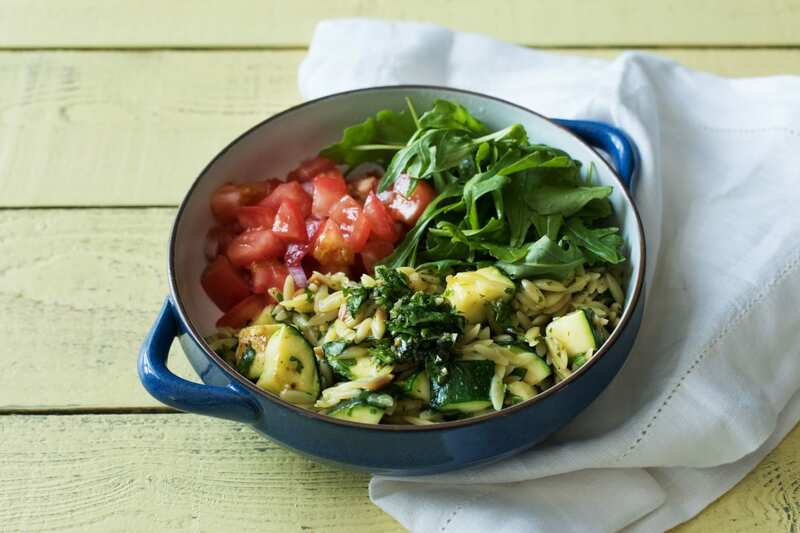 Once your orzo is cooked, stir through three-quarters of your pesto along with your charred courgette. Serve in bowls with your remaining rocket, tomato salad and a spoonful of your extra pesto on top. Enjoy!